Well, after six days in Belgium, it was time to pack up our bags, head back over to Brussels’ Station Midi, and take the Eurostar back to England. Two hours later, we found ourselves back in Central London at St Pancras station, and a short tube ride down the Victoria line had us back in Pimlico. 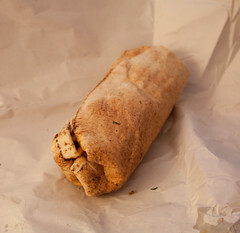 And, after that voyage, we were starting to get hungry, but several days of eating mussels, steaks, filet americain, and the like had us craving something at least a bit healthier, so we decided it was time for a trip down the street to get some falafel. Luckily, my brother lives off of Tachbrook Street, home of the Tachbrook Street Market. While Tachbrook Street has been a nice little street market for several years (longer than I’ve been coming to London), a few years ago the Westminster City Council did a substantial renovation: the road is now more or less permanently a street market and not a vehicular passage, utility hookups are provided for all the vendors (in neat little boxes that fold up out of the street), and most importantly, it has a lot more vendors and more regular hours. Monday through Saturday, 8 am through 6pm, the places is filled with vendors, most of them food vendors, ranging from grocers, to a coffee stand, to prepared food vendors, all selling from their stalls. 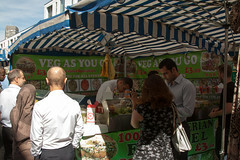 And one of the more regular vendors is a Middle Eastern falafel joint, Veg As You Go: Falafel Specialists. Like a typical street market or farmers market, Veg As You Go isn’t exactly a large operation. Basically, it consists of a deep fat fryer (with falafel balls grilled to order), a refrigerator case of ingredients, and a prep counter with a sandwich press. It’s just the basics, but it turns out that having just the basics is quite enough. The menu is simple, you basically order a falafel, with your choice of toppings (eggplant, pickled turnip, hot sauce, and a tahni drizzle). They do turn out a rather good product. 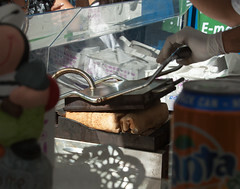 They pack the falafel into patties as you order it, and a fresh stream of fried falafel is always coming out of the fryer. Indeed, they’ve usually got a slight surplus, offering up falafel samples to people still waiting in line. 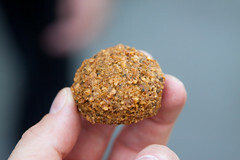 And it’s a good falafel: a nice rich, moist, and nutty interior of chickpea and spice goodliness, with a crisp outer wrapping. 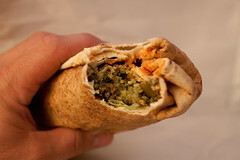 Add in some good fresh veggies, some pickled turnip (I passed on the eggplant, as eggplant has a strong tendency to give me headaches), and then some tahini, taking the assembled pita and toasting it on a sandwich press, and you’ve got a great falafel pita. Three quid, and you are good to go.